5 Reasons Why You Should Join our Club! 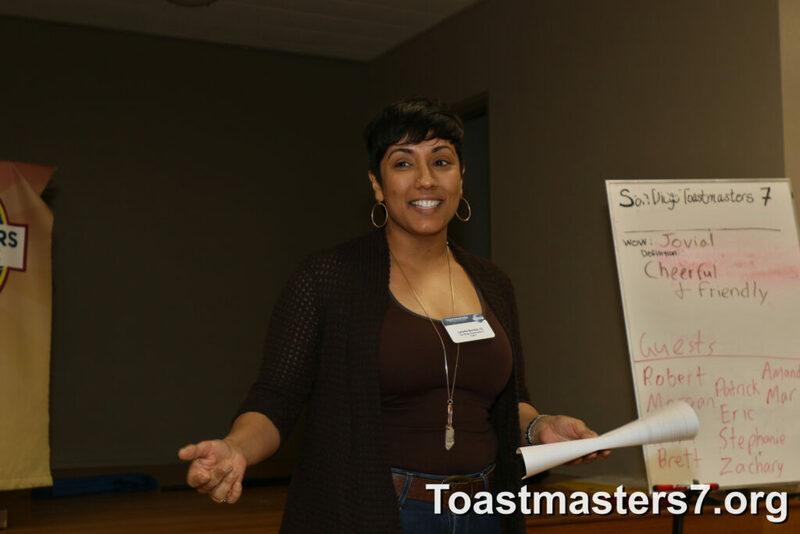 JOIN SAN DIEGO TOASTMASTERS 7! While Having the Time of Your Life! Experienced? Take your communication and leadership skills to a new level of mastery. Congratulations – you’re on your way to becoming a better communicator and leader! Toastmasters International, founded in 1924, is a proven product regarded as the leading organization dedicated to communication and leadership skill development. As a member, you will gain all the tools, resources, and support you need. Through its worldwide network of clubs, Toastmasters helps nearly 280,000 people communicate effectively and achieve the confidence to lead others. Why pay thousands of dollars for a seminar or class when you can join a Toastmasters club for a fraction of the cost and have fun in the process? All your learning will take place in a fun, supportive environment! Toastmasters is a place where you develop and grow – both personally and professionally. You join a community of learners and in Toastmasters meetings we learn by doing. Whether you’re an executive or a stay-at-home parent, a college student or a retiree, you will improve yourself; building skills to express yourself in a variety of situations. You’ll open up a world of new possibilities! Lead meetings and participating in them more confidently. Even handle one-on-one interactions with family, friends and colleagues more positively. The environment in a Toastmasters club is friendly and supportive. Everyone at a Toastmasters meeting feel welcome and valued – from beginners to advanced speakers. In a club meeting, you practice giving prepared speeches as well as brief impromptu presentations, known as Table Topics. There is no rush and no pressure: The Toastmasters program allows you to progress at your own pace. Constructive evaluation is central to the Toastmasters philosophy. Each time you give a prepared speech, an evaluator will point out strengths as well as suggest improvements. Receiving – and giving – such feedback is a great learning experience. In Toastmasters, encouragement and improvement go hand-in-hand. You won’t regret it. Toastmasters currently has more than 332,000 members in 135 countries. Our club is just one of the more than 15,400 clubs located around the world. For membership or meeting information, please see our meeting information page. By learning to effectively formulate, organize and express your ideas to others, you can achieve all kinds of success. You’ll be more capable and confident when giving presentations. You’ll be more persuasive when pitching prospective clients. Want to be better at negotiating your salary with your boss? Networking at business or social functions? Motivating co-workers or your kids? Anyone who is a strong leader has to first be an effective communicator. In Toastmasters you will hone your speaking skills, and you will develop leadership abilities – through evaluations, listening, mentoring, serving as club officers and filling roles in club meetings. You will take those leadership skills out into the world, running businesses, mentoring youths, organizing fund-raisers, coaching teams and heading up families. Get ready for many wonderful memories! Become the speaker and leader you want to be. Confident, charismatic leaders weren’t born that way. Toastmasters members learn to tell their story. They listen and answer. Through our community of learners, they find their path to leadership. Find out what’s special about our club -> 5 Reasons to Join our Club! For meeting information, please see our meeting information page. 25 Apr – Regular Meeting and Toast-a-Member Night to commemorate Club 7’s 89th Year Anniversary!! Member in the Spotlight with Christoph Kubitza. One of our longtime members is Christoph who joined in back in April 2004. Christoph has been instrumental in the growth of San Diego Toastmasters 7 serving as a mentor to various members of the club. 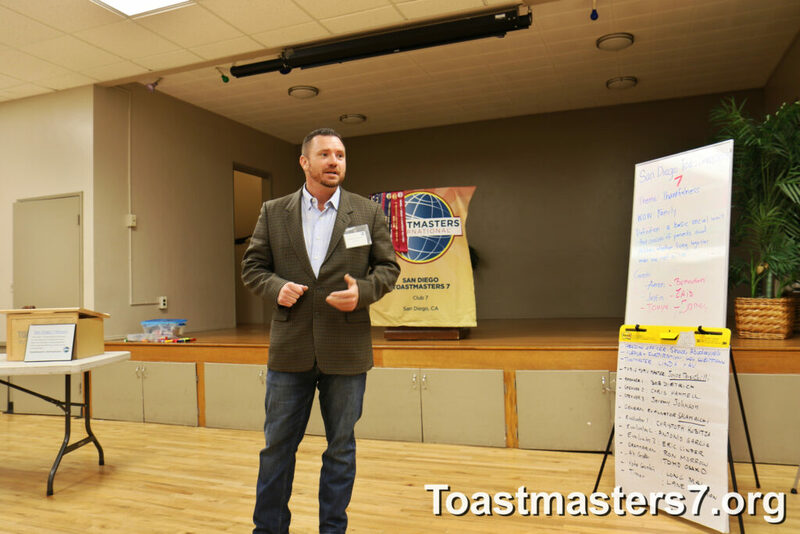 He is also helping to grow another club in San Diego, Creatively Speaking Toastmasters. Currently he serves as the Club Treasurer. © 2018 San Diego Toastmasters 7. All Rights Reserved.